Lahinch Hostel is located on the extraordinary coast of Clare, close to the magnificent Cliffs of Moher and the remarkable Burren. The town's excellent expanse of surf and sand is a year round playground for surfers, wind surfers and kayakers from around the globe. Come evening, Lahinch positively lights up with its famous nightlife. 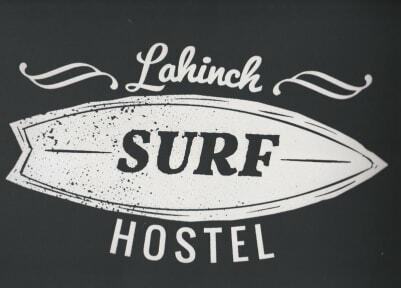 Our hostel is in the heart of Lahinch, a stone's throw from the sea, shops, pubs and restaurants. We are conveniently situated at the south end of the Old Prom, a gathering place for holidaymakers and surf spectators. A short walk down the promenade brings you to the Seaworld and Leisure Centre, an indoor swimming complex coupled with fascinating Atlantic aquarium exhibits. Also seaside, golfers can enjoy one of the best links courses in Ireland. Lahinch has something for everyone, and the hostel is close to it all. We have 55 clean and comfortable beds in a variety of centrally heated dorm, private and family rooms. Along with free hot showers in our spotless bathrooms, we have outside facilities for wet-suit rinse off. To make your stay more affordable, we boast a well-equipped self-catering kitchen with generous seating. In addition, you can relax and meet international travellers in our spacious lounge with cable TV and DVD. 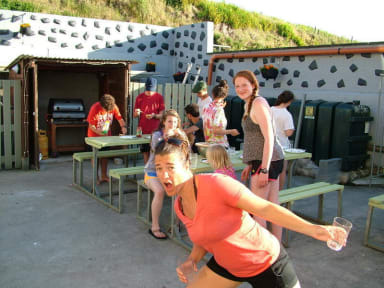 Our Hostel's beautiful outdoor BBQ area has plenty of seating, 3 picnic tables and a gas run BBQ. The BBQ is free for guests to use, and our out door area has great lighting, and is an ideal place to host a great evening BBQ. Surfers can enjoy a warm shower straight after the surf. Our Water sports changing area is a dressing room with 8 warm showers, toilet facilities, 2 wet-suit closets for hanging up wet-suits and racks for storing surf boards. We also have free access to the internet on our guest computer and free WiFi access while you stay at our hostel.